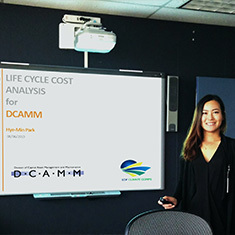 Hye Min Park helped Massachusetts DCAMM adopt Life Cycle Cost Analysis for its efficiency projects. For the fourth year in a row, the American Council for an Energy Efficient Economy (ACEEE) named Massachusetts as the most energy-efficient state in the nation. Striving to maintain its status as a sustainability leader, the Massachusetts Division of Capital Asset Management and Maintenance (DCAMM), the agency responsible for managing and maintaining public buildings and construction projects, hired Hye Min Park as its 2015 EDF Climate Corps fellow. At the time, DCAMM was overseeing 80 million gross square feet of space including over 6,300 structures on 276 campuses. The project budget for 2015 was $370 million for 170 active projects including new construction and existing building upgrades. DCAMM was already committed to energy efficiency; however, Jenna Ide, Director felt that DCAMM needed a new framework to accurately compare the costs and benefits of efficiency projects. She knew that the organization needed to go beyond evaluating projects based on initial costs and simple payback metrics. Park agreed that evaluating efficiency projects based on initial costs neglected to take into account future operation and maintenance considerations. To get a more complete picture, she recommended that the agency adopt a more sophisticated tool: Life Cycle Cost Analysis (LCCA). The answer wasn’t quite so simple, though, due to the agency’s broad range of projects, from thousands of dollars to millions of dollars in size. Park recognized the need for consistency in how LCCA was applied in order to ensure the sustainability of future budgets and better management of the state’s vital building assets. Over the summer, Park worked to apply LCCA to the state’s property assets to inform and improve strategic capital investment. She worked closely with several teams within DCAMM to set up the analysis tool and then create customized guidance to support improved project evaluation. Park hopes that the new LCCA tool will allow the agency to assess the short-term and long-term costs of capital intensive, but efficient technologies, including renewable energy generation. Using LCCA could help DCAMM better allocate its limited budget to more efficient and resilient options such as net zero energy buildings and passive design. At the end of the summer, DCAMM determined that the tool should be applied in the evaluation phase of 70 projects every year. After 7 years of working in the renewable and conventional energy industry, Hye-Min Park decided to pursue an education focused on environmental problem-solving and is now specializing in energy & climate at the Bren School at UCSB. Her master’s thesis project is developing a roadmap for UCSB to achieve carbon neutrality by 2025.